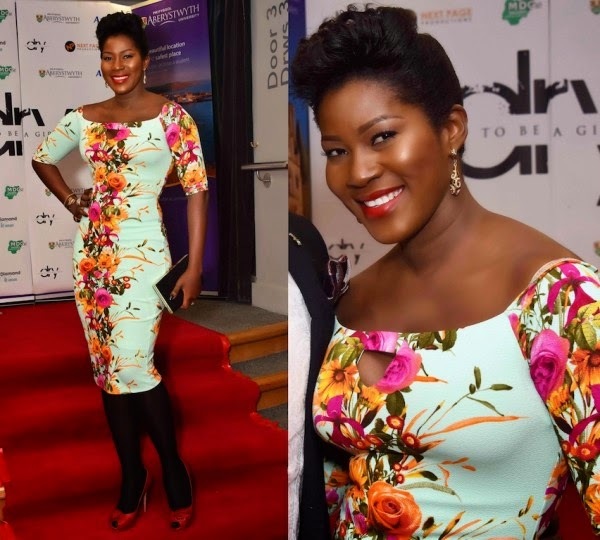 On Saturday 29th November 2014, Nollywood star Stephanie Linus premiered her anticipated movie – 'Dry' at the Aberystwyth Arts Centre, Wales, UK. The movie is centred on the adverse health effects of being a child bride. For the premiere which played host to 150 guests including hubby Linus Idahosa and iconic actress Liz Benson, Stephanie looked beautiful in a floral print dress. She styled the knee length frock with three-quarter sleeves, gold drop earrings, a selection of gold bracelets, black stockings, a black clutch and a pair of red heels. For beauty, Stephanie styled her locks into an up-do and opted for red lipstick.